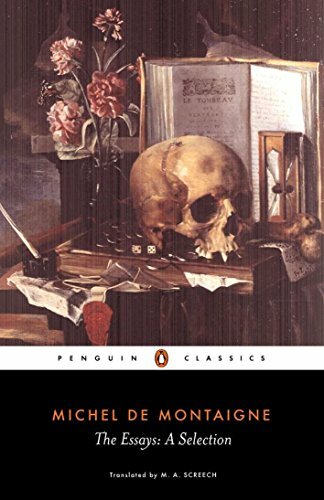 A survey of one of the giants of Renaissance thought, The Essays: A Selection collects some of Michel de Montaigne's most startling and original works, translated from the French and edited with an introduction and notes by M.A. Screech in Penguin Classics. To overcome a crisis of melancholy after the death of his father, Montaigne withdrew to his country estates and began to write, and in the highly original essays that resulted he discussed themes such as fathers and children, conscience and cowardice, coaches and cannibals, and, above all, himself. On Some Lines of Virgil opens out into a frank discussion of sexuality and makes a revolutionary case for the equality of the sexes. In On Experience he superbly propounds his thoughts on the right way to live, while other essays touch on issues of an age struggling with religious and intellectual strife, with France torn apart by civil war. These diverse subjects are united by Montaigne's distinctive voice - that of a tolerant man, sceptical, humane, often humorous and utterly honest in his pursuit of the truth. M.A. Screech's distinguished translation fully retains the light-hearted and inquiring nature of the essays. In his introduction, he examines Montaigne's life and times, and the remarkable self-portrait that emerges from his works. Michel de Montaigne (1533-1586) studied law and spent a number of years working as a counsellor before devoting his life to reading, writing and reflection. If you enjoyed The Essays: A Selection, you might like Francis Bacon's The Essays, also available in Penguin Classics. View More In Literature & Fiction. God Of The Dead: Unleaded Version With No Adult Language.